Dominos - if you own this you need to know what has been going on – it’s quite incredible. 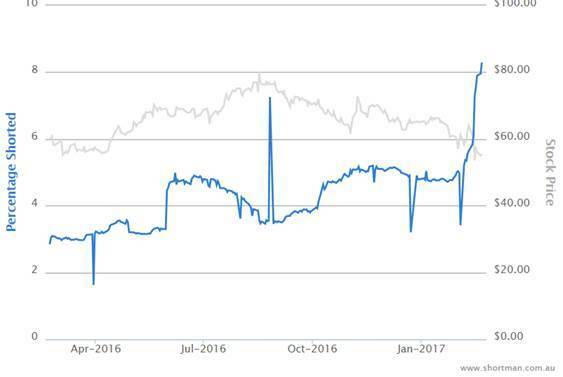 Dominos stock went ex-div on Tuesday 21st Feb and ended up closing up +36c or +0.65%, and at its high it was up +1.05 or +1.9%. That is normally a very good sign of underlying strength – but this time I’m just not so convinced. Well what is truly amazing (to me anyway) is that the shorts have really taken to this stock. Over the years as I was positive on Dominos (from $14), I found many instos were too scared to buy them for fear that the stock was on 50x to 60x, expensive, and going to come crashing back. My rational was it was growing at such an exponential rate - it would hold its gains and continue higher. But as mentioned 3 months ago, having been a big supporter, & cannot go near them anymore, despite their great profit and growth numbers, that may be slowing from that exponential speed we saw for so long. Too many things are turning against them right now (PE still the biggest issue). Well those who were not buyers at $11 are more than likely never going to be buyers until its PE comes right back. But the stock has another - more serious issue to deal with. 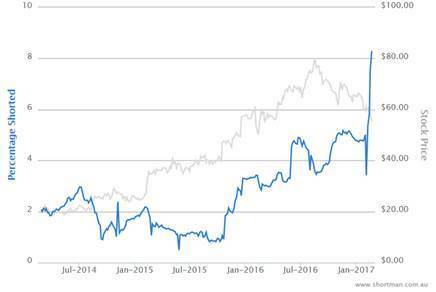 Dominos now has its highest short position ever the shorts can see blood in the high PE stocks and this one - had ;- initially withstood the storm & better & than other & high PE stocks. But it has been savaged hard in the last few months. All they need (or don't need) is a small trip and the stock could get hammered even more (although it's more 'likely' that this stock just moves sideways for a long time). Also the other problem with DMP is - having traded it for clients over the years - it’s a real tough stock to buy or sell as liquidity is so thin. So if the buyers are drying up and the shorts increasing, I can't see Dominos rallying back to $80 in 2017. I may be wrong, but I'd prefer just play a wide berth on DMP while PE de-rating is going on. On the 9th Jan 2017 they were at 4.73%, then a few shorts went on just before the result, taking them up to 5.35% just before they reported. On the day they reported (having already fallen heavily into the result) the stock dropped another -14%on the day from $62.54 to $53.56. Since then the stock price has recovered +4% back to $55.81. But the shorts continued over this time to increase to now a record of 8.29% of the company. So in the last 6 weeks the shorts have increased from4.73% to 8.29% or up 3.56% or as a % 75% - amazing ..
That is real conviction that you rarely see the shorts get wrong (they sometimes do in long term - but rarely in the short term) .. So the Shorts have declared their hand and this is going to be one very bloody battle. So instos may see that if the shorts are "peaked out" then maybe they can squeeze them ... could be an interesting register to watch from both insto moves & short selling moves..
(1) This Shows Domino's short interest going up recently - extraordinary !! the spike is unbelievable - as though they have finally discovered their weakness & are all piling in. which begs the question many will ask - who is lending the shorts all this stock - answer - you may not want to know the answer as it may shock you - they ahve to "borrow" it from somewhere !!! (3) This is again one that may make the instos feel a bit better that then can soon take on the shorts.. It shows how much of the daily trading volumes in Dominos have been "short sales". 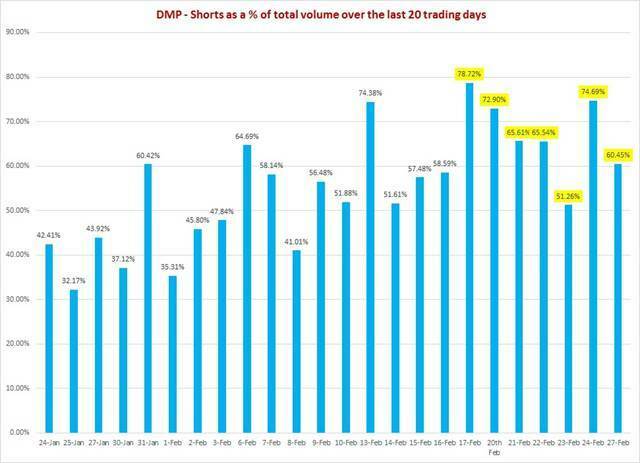 Now what we can see is that before the shorts were running at 35% to 43% of daily turnover, but since their result on the 15th Feb (look from 17th Feb as short data is delayed by a few days) - we can see that on the 17th Feb (which corresponds with the day DMP reported -2 days) saw shorts account for 78% of the trade - which also explains why stock was down -14%,. BUT in the 7 trading days (not forgetting short trade data is delayed) - the shorts have been roughly 67% of daily volume since then. So with shorts at 8.29% of coy (or 18.8% of free float - assuming all instos are LT holders) then they must be close to being "maxed out" - which is when the instos may try & squeeze them? All very exciting, but what is the benefit of short selling to the economy as a whole? I've yet to see a convincing explanation of why we need it.